The guys in blue in the above images are are flattering (saying oseji). The linguistic content of their flattery matters so little that there is no need to be able to read the captions, or if it were a real situation, to hear what the people are saying because the situation, body language and the ubiquity of the phenomena gives it all away. 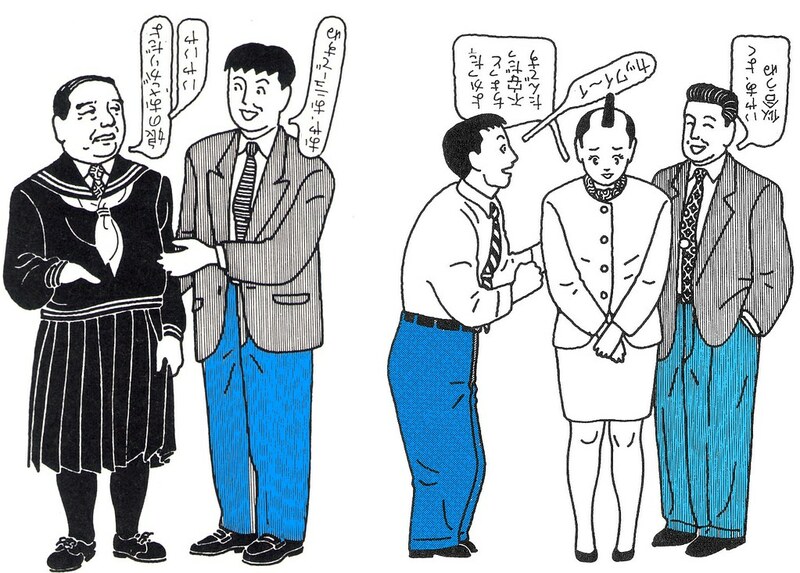 Japanese flatter each other so phatically that contradiction ("iya iya" of the guy on the right) is expected, anticipated, and if you are an adult Japanese person, usually carried out. The act is the focus and medium of the message, and massage (McLuhan & Fiore, 1967), while the linguistic content is the 'context' (Hall, 1976), the 'wrapping' (Hendry, 1995) and the 'emptiness' (Barthes, 1983) that merely facilitates. I confess that I am still inclined to say "thank you," and accept the linguistic content as if it were meant sincerely, socially inept as I am. Barthes, R. (1983). Empire of Signs. (R. Howard, Trans.). Hill and Wang. Hall, E. T. (1976). Beyond Culture. Anchor Press. Hendry, J. (1995). Wrapping Culture: Politeness, Presentation, and Power in Japan and Other Societies. Oxford University Press, USA. Ishihara, S. 石原壮一郎. (2006). 大人養成講座 (PB版). 東京: 扶桑社.